We advise current and/or former staff to report any abuses you may have witnessed while working at the Circle of Hope Girls' Ranch. For information on your rights and how to take action, visit www.heal-online.org/blowthewhistle.htm. If you were fired or forced to resign because you opposed any illegal and/or unethical practices at Circle of Hope Girls' Ranch, you have the right to take action. 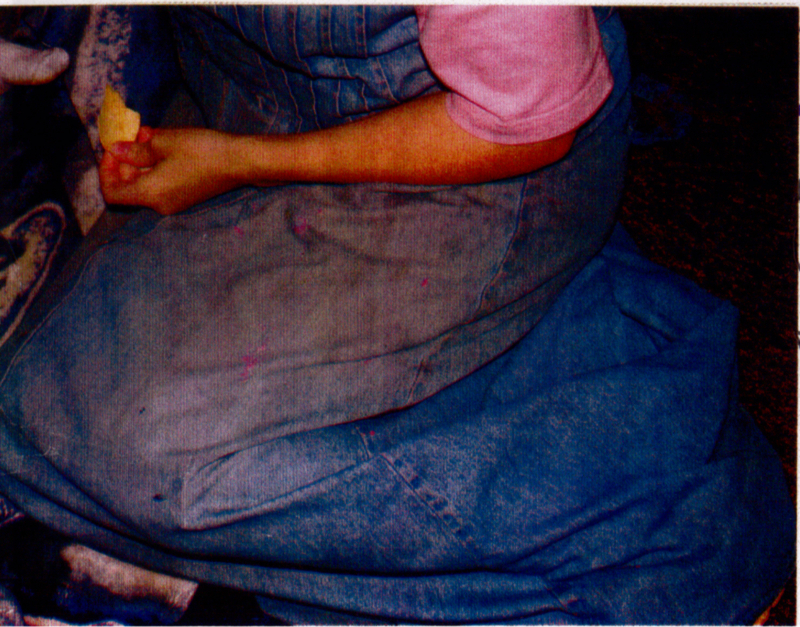 If you were harmed (family or survivor) by Circle of Hope Girls' Ranch, please contact info@heal-online.org if you remember the long-term employees and from which years. This will help! Also, if you recognize any of these staff as having worked at another program, please send in any information about their past or present employment at other facilities and/or cults. Please don’t place your loved one in Circle of Hope Girls' Ranch and rescue them if they are there now. I am the CEO and Founder of Circle of Hope Girls Ranch. Husband, Father, Grandfather. Separated, Independant, Fundamental Baptist! twitter.com/Gunslinger4God - Cached Householder is not a licensed mental health nor medical professional in Missouri. Source: https://renew.pr.mo.gov/licensee-search.asp HEAL has contacted the MO DESE and we are awaiting their response regarding Householder's educator certification status. Stephanie Householder Wife of Owner Householder also works at this program. Source: https://renew.pr.mo.gov/licensee-search.asp (Note: This may be a different person. Boyd's wife's middle name is Anne. But, this does not mean that the nurse above is the same person. If you can confirm whether or not Stephanie Householder the co-owner of Circle of Hope and Registered Nurse Stephanie Householder are the same person, please e-mail us and let us know. Thanks!) HEAL has contacted the MO DESE and we are awaiting their response regarding Householder's educator certification status. Ron Sheldon Staff (Former) Reportedly worked at this program from 2007-2009. Sheldon went on to work for Agape Boarding School in MO. HEAL received a report on September 26th, 2010 regarding neglect and abuse at this facility. We highly recommend families do not entrust their children to this "Gunslinger". HEAL will be alternating table rows between Circle of Hope's writings, government response, and academic concerns. We will be posting commentary between rows to help explain and contextualize the primary source information presented. We begin by showing a print out of the Circle of Hope Girls' Ranch's website in which they claim to be registered with the state of Missouri Board of Education. As you will see below, this was a false statement made by Circle of Hope Girls' Ranch regarding their status. It is not accredited nor registered with the Missouri Department of Education. The above is a printed copy of the Circle of Hope Girls' Ranch website. Circle of Hope Girls' Ranch clearly states that it is registered with the Missouri Board of Education. Following are two letters evidencing that Circle of Hope Girls' Ranch has NEVER been registered nor accredited by the Missouri Board of Education. In the same month and year that the website for Circle of Hope claimed to be registered with the Missouri Board of Education, the Missouri Department of Education wrote stating that Circle of Hope Girls' Ranch is not registered with their office. Circle of Hope lies and uses deceptive marketing practices. The Missouri Department of Education has no record of Circle of Hope Boarding School. HEAL provides the above to further demonstrate that Circle of Hope is not accredited nor registered as a school with the state of Missouri. Boyd Householder's supporters claim that the program is not about making money, but, about "helping girls find hope". However, he makes a point to complain about a $0.59 postage due issue to a parent who is thoroughly dissatisfied with the lies and abuse at Circle of Hope. 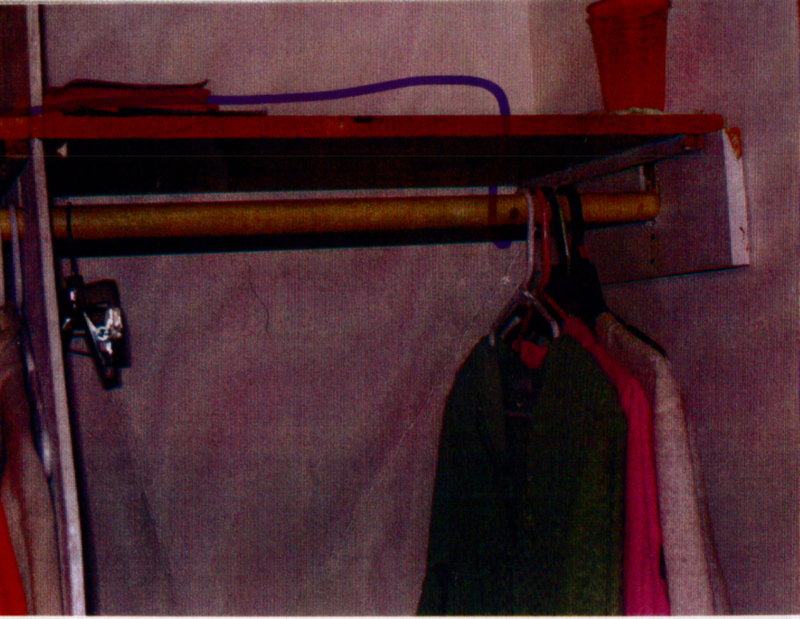 Readers may find it of interest that Householder claims the girl was never enrolled in the program even though they held her in the program for months and received thousands of dollars from her family. Beyond this, once you've been caught lying and cheating people out of thousands, is it really appropriate to make a "stink" about 59 cents? We don't think so. Below is a copy of the enrollment information for a girl after a quarter being at Circle of Hope. We include this to show that upon entering her new school, she did not have the academic credits promised by Circle of Hope. In addition, most programs in the industry ask families to fill out release of information forms and contact former schools for the necessary transcripts. Generally, schools will and have a policy to handle such requests. It is strange that a girl would be in the program for 3 months without anyone at the "school" noticing that she did not have her transcripts or other necessary paperwork for progress and success in the program/school. Regardless, it shows incompetence at best and downright fraud at worst in regards to "Circle of Hope". Coupled with the evidence regarding Circle of Hope's lack of accreditation/registration with the Department of Education and dishonesty in that regard, we lean more towards believing the worst in this case. It is absolutely obscene that anyone would run an unlicensed, unaccredited, unregistered program and convince families they provide an education when it is clear they do not. Below is a letter Mr. Householder sent to parents. The tone is offensive and antagonistic. It is clear this man has no respect for parents or their families. Circle of Hope Girls' Ranch appears to be little more than a money-making cult and scam. Parents should always be respected and included in decisions regarding the treatment and welfare of their children. It is wholly inappropriate for Mr. Householder to demand such complete control over the entire family and to hang up on parents who call with questions he doesn't want to answer. If you care about your child, we believe you will avoid Circle of Hope Girls' Ranch. 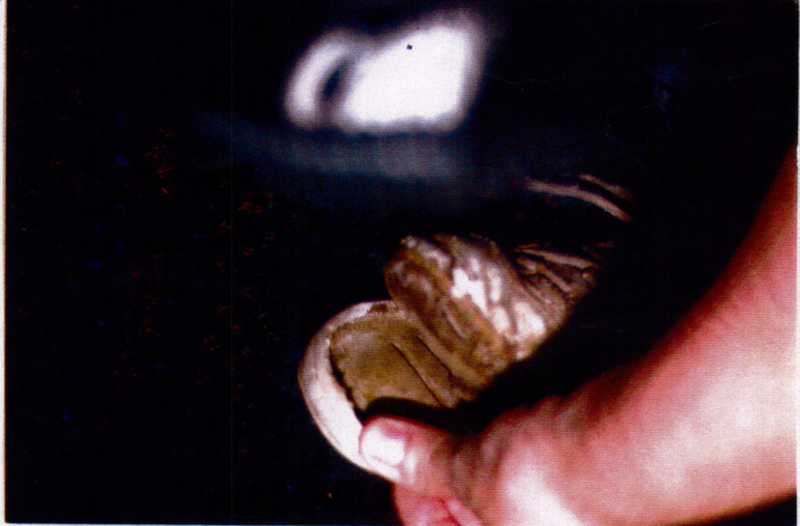 1B: injury to the foot due to the lack of protection in working with the horses on the ranch. 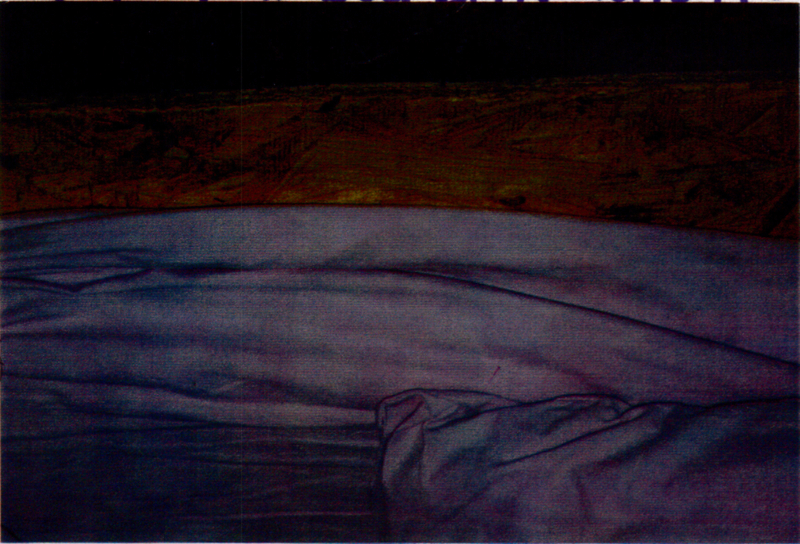 BED: Wait there is NO BED! But that I was told was because someone else paid more than we did! (So they aren't in it for the [money] but they will take mattress to get more $ for another girl! Uniforms: yes they charge $300.00 for the salvation Army REJECTS that they get donated! They do however have a nice outfit for church . The "School" uniform is nasty and dirty! Additional Evidence: Pat Kaiser of MO Department of Education Wrote on March 1st, 2011 that Circle of Hope has never been registered with the Department of Education. 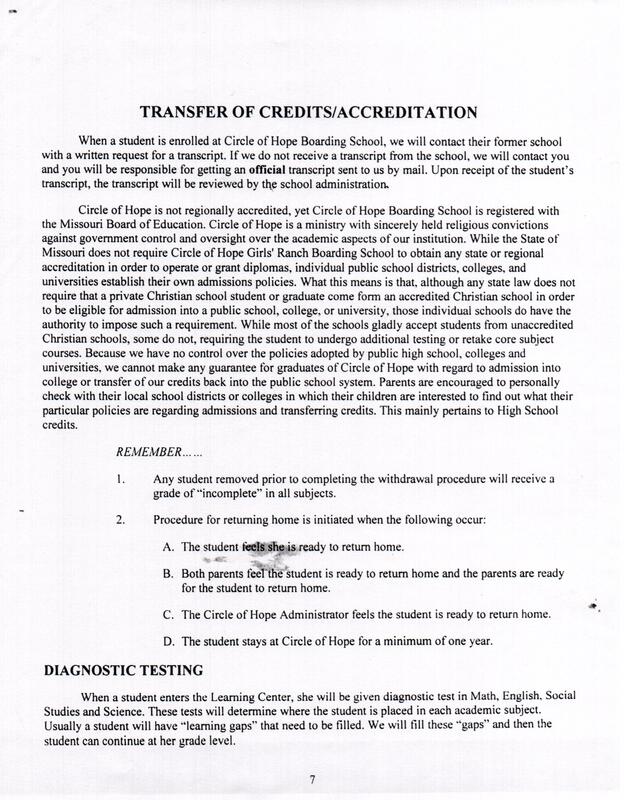 And, in the student handbook for Circle of Hope in 2007, Circle of Hope falsely claims to have an "education center" and to be registered with the MO Department of Education.